Why Use Email to apply for aviation jobs? Applicants want to apply for jobs, send their resumes, and converse with potential employers by email and most aviation employers prefer it this way. Both applicants and employers want to contact each other by email. Aviation related companies make extensive use of email because it is fast, flexible, and reliable and less expensive than buying stamps, or making long distance telephone calls. Usually, it takes only a few seconds or minutes for email to arrive at its destination. This is a particularly effective way to communicate with a potential employer because you can quickly notify a hiring manager that you are interested in an available position, answer questions, or follow up after an interview. 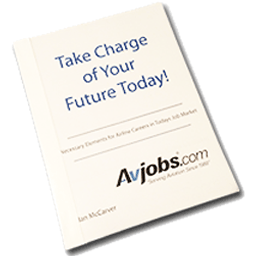 Avjobs can send you automatic email alerts regarding jobs that fit your interests and qualifications. Time is one of our most valuable assets. Using our email alert service will streamline and automate your job search. By including information about your education, experience and preferred location in your member information, you will receive a weekly email alert when a position is posted that matches your preferences. Most of us have an ideal job in mind. It may be a particular position within an organization, at an organization of a certain size, or in a specific field. Or perhaps you would move closer to an aging parent if the right opportunity were presented. By utilizing our email alert service you can be sure to be made aware of such opportunities as they arise. You may broaden your preferences and selection criteria to receive more email alerts. Add your name to our FREE - Weekly Aviation Employment Newsletter. And always feel free to contact us for assistance.